Cell-type and brain-region resolved mouse brain proteome, Sharma et al. Any protein of interest can be searched using ‘Protein Groups’ tab and by activating the ‘search’ option. 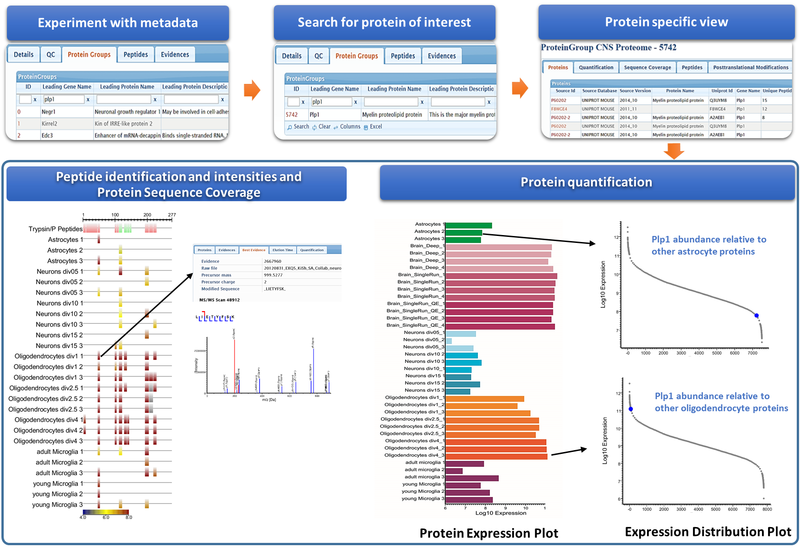 The resulting protein quantification page (after clicking a selected protein group ‘ID’) allows visualization of protein quantification (using ‘Quantification’ tab) and of sequence coverage with a view of peptides identified. Peptides contributing to protein identification are visualized and can be further viewed as quantification panel and representative MS/MS spectra for peptide identification.